Disney Babies Blog: October Giveaway! 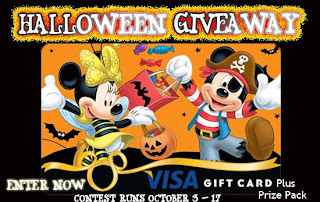 In honor of Halloween, I've once again teamed up with a great group of Disney bloggers to offer a big giveaway - $100 Visa Gift Card and a Halloween Prize Pack! It is mandatory to leave a comment. If for some reason you are unable to on the site you are on check the other participating blogs running this giveaway and try there. All rafflecopter entries go to the same contest no matter what participating blog you are on. One of the extra entries is to leave a comment on another post. You can comment on a different post on any of the participating blogs just make sure you put the link to it in the rafflecopter. Winner will be announced at dragynally.com via a post entitled "Halloween Winner". Winner must contact DragynAlly via email thedragynslair@gmail.com within one week of winner announcement. It is the responsibility of the winner to check dragynally.com to see if they have won. After a week if the winner has not come forward a new winner will be drawn. It is not my responsibility to make this giveaway easy for you. If you do not have a compatible browser or the widget I use for comments doesn't work for you it is a shame but there is nothing I can do. Entering this giveaway is completely optional. Those who choose to will have the opportunity to win. Giveaway starts October 3 at midnight and ends October 17 midnight EST. Many will enter one will win. Good luck! And may the best ghoul or dracula win! "Follow @disneybabiesblog on Twitter" says NOT FOUND. Should it be this twitter handle @Disneybabiesblg ? Thanks for pointing out the error - it has since been fixed! Costumes! So much fun to dress up and dress our child up! Not quite. Google friend connect is on the sidebar. It says "follow me" or something similar- it makes the blog show up in your Google reader! Wish we could do one of these special Disney holiday parties someday. They look like fun! I've always loved Halloween. I like the costumes, the candy and I do enjoy spending October at Disney! So fun! My kids dress up Disney every year! My favorite thing is the wonderful weather and seeing my little ones dressed up! I never liked it much when I was younger, but now that I have kids I love seeing them enjoy it. I love seeing all the kids cute costumes! I love halloween because i love picking out costumes and decorating the house!